Planning for you and your family’s future can sometimes be a daunting task. It’s often frustrating and perhaps emotional at times. When you’re ready to begin writing a will, deciding whom will receive your wealth, and dividing assets, turn to DeFord Law Firm. Our estate planning attorney team is experienced with the many legal requirements needed to complete your plan. With us by your side, you can be certain hard-earned assets will be well protected and distributed according to your wishes. The first step to estate planning is to create a last will and testament. This will mostly determine how your property will be split once you’re deceased. 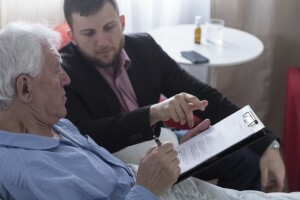 However, it can also include things like guardianship appointment and independent executor appointment, which keeps court costs low by minimizing court supervision over your estate plan. If you pass away and don’t have a will comprised, the state of Texas will determine how your property will be divided, which may not be the way you would choose. For peace of mind knowing your hard-earned assets will be protected, rely on the professionals at DeFord Law Firm to write up your last will and testament. We make the process smooth and hassle-free from start to finish. Want to get started on your will? Also called a living will, an advanced healthcare directive is a legal document that outlines a person’s wishes for their health should they be unable to make decisions for themselves due to an illness. Even if you’re young, this is an important part of estate planning that will determine what actions will be carried out in the event you become incapacitated. Our estate planning attorney team can help walk you through the various options you have for a living will document. Want to begin a living will or power of attorney? Ready to plan for the future by means of a trust?